You will receive information on a national voter protection hotline (866-OUR-VOTE) operated by the Lawyers’ Committee for Civil Rights. Appropriate reports will be passed on to law enforcement and election officials, and voters will have the opportunity, if they feel safe doing so, to share photos of voter intimidation on social media. There has already been an incident in Virginia. A Guy In A Trump Shirt Carried A Gun Outside Of A Virginia Polling Place. Authorities Say That’s Fine. Compare to how the right-wing acted when they have video of a New Black Panthers member with a night stick in 2008. 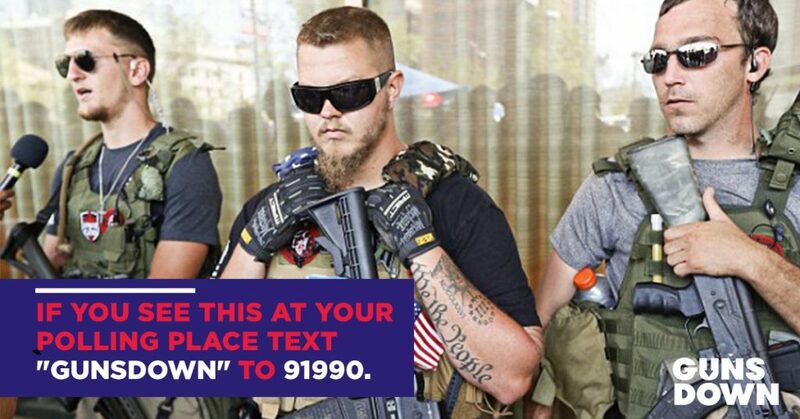 Will Fox News do the same kind of story about voter intimidation when it is white men with a gun? No. But the mainstream media will cover it. We will see them go thought all the same steps they did in that Huffington Post article. 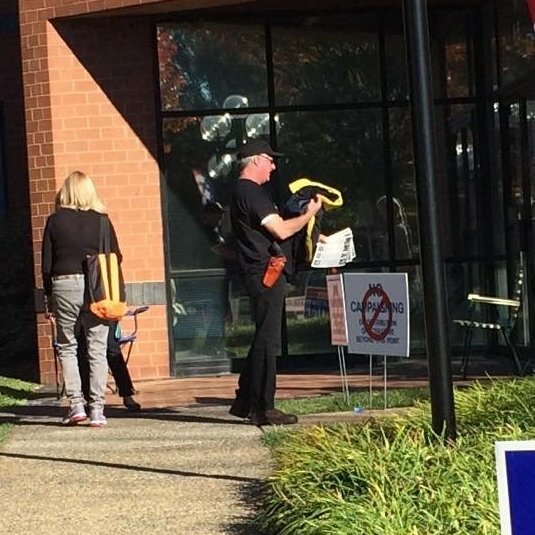 COURTESY ERIKA M COTTI A man carrying a weapon outside of Loudoun County Registrars Office in Leesburg, Virginia. What did the authorities do? Nothing. They checked with election officials, “They said that there’s nothing they could do, that he was well within his rights to be carrying his weapon,” said Judy Brown, Loudoun County registrar. Estrada said he doesn’t want to specifically ban his volunteers from carrying weapons. Why did the Republican push that New Black Panther story so hard? Because the modus operandi of the right-wing is to find an example of a few people on the left doing things that the RIGHT does all the time. It’s their “man bites dog” story method and it’s pushed up to the MSM so they can use as an example for their “both sides do it” stories. Friday’s incident in Loudoun County, involving a white Republican, seems pretty unlikely to attract the same type of attention. Eight years ago, not everyone had a video camera in their pocket and a way to gather and then distribute the footage to millions. Now we do. If we want something to “get attention” we need to realize that the so-called liberal media is not going to do it for us. We need to. Social media is one way. We also need to understand the continuing amplifying affect the right-wing media has within its own world. They will keep pushing their stories into the MSM. But what works for the right, when it comes to pushing stories, doesn’t work the same for the left. The “so-called liberal media” isn’t going to give us the same kind of treatment they give to the right. Partly because when the right is busted lying, THEY DON’T CARE. If news broken by the left is on a real issue you can expect the MSM will apply rules on how they cover our stories that they don’t apply to the right. We need to be prepared. 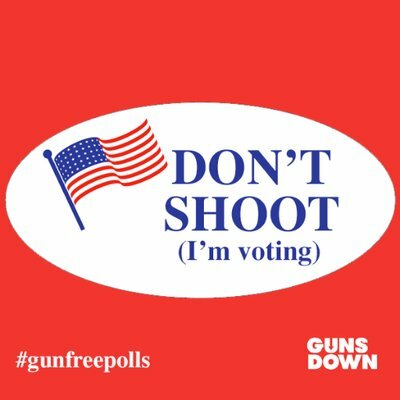 This election there might be photos, videos and footage of men with guns at polling places. The stories will be accompanied by quotes about how it’s “perfectly legal.” But that doesn’t mean it has to stay that way.